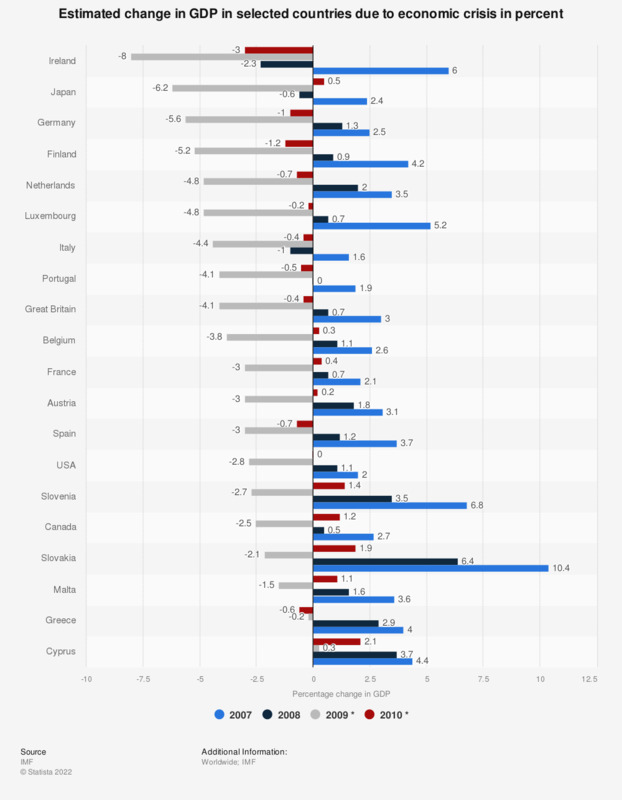 This statistic shows the estimated change in GDP due to the economic crisis in selected countries. In 2009, the GDP of Ireland will fall by 8 percentage points. * The data for 2009 and 2010 are estimated. Do you think you will ever experience something else than the current economic crisis? Have you personally noticed any signs of economic recovery? According to you, when will the current economic crisis be over? According to you, who is to blame for the current economic crisis? How difficult is it in your country for a young person to get a better job and to become wealthier than his or her parents were? In your opinion, is the current suicide rate in France attributable to the crisis in our country? Do you think the power that Germany and other European Union countries have over the economy poses a major threat to the economic well-being in your own country?